Part I: Conceptual, National and International Legal Frameworks. Curtin D & Dekker Ige, ‘Good Governance: The Concept and its Application by the European Union’. Addink H, ‘Principles of Good Governance: Lessons from Administrative Law’. Verhey L, ‘Good Governance: Lessons from Constitutional Law’. Wouters J & Ryngaert C, ‘Good Governance: Lessons from International Organizations’. Part II: Institutional frameworks. Vos E, ‘The Role of Comitology in European Governance’. Van Ooik R, ‘The Growing Importance of Agencies in the EU: Shifting Governance and the Institutional Balance’. 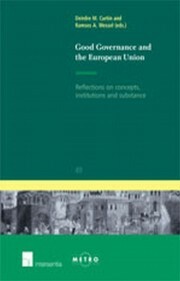 Verhoeven A, ‘Democratic Life in the European Union, According to its Constitution’. Part III: Substantive Frameworks. Heldeweg H, ‘Good Environmental Governance in the EU: Lessons from Work in Progress?’. Wessel R, ‘Good Governance and EU Foreign, Security and Defence Policy’. Peers S, ‘Governance and the Third Pillar: The Accountability of Europol’.